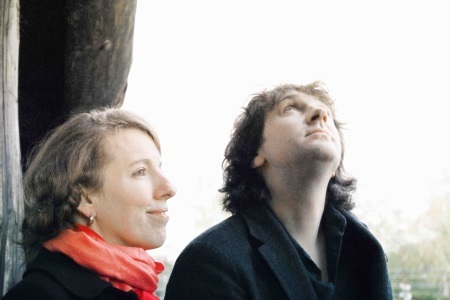 Canadian-Ukranian shoegazers Ummagma pulled of a rare feat when they released two full-length albums (Antigravity and Ummagma) on the same day in 2012. Since then things went mostly quiet save for the cherrypicking tracks from those albums as singles and videos and Lama Remixes EP in 2014. Shauna McLarnon (vocals, composition, lyrics) and Alexx Kretov (composition, instruments, arrangement, recording, vocals) are back with three new tracks on the new Frequency EP: the slow moving dream pop tune with multi-layered vocals Winter Tale, the spacey orchestral instrumental Galacticon and the short Ocean Girl sound like The Smiths's guitar tone joined forces with Toots Thielemans' harmonica. All other tracks are previously released. Old war horses Orion and Lama are included as well as three new remixes of the latter track, so longtime followers of the band can feel a bit shortchanged when they go for the full release. Frequnecy is a self-released EP (Raphalite Records in the UK). (Buy them from their website. HCTF reviews of Antigravity and Ummagma.